Slightly amended (poor print) from the Western Argus (Kalgoorlie, WA) 8 April 1930. Girl — No, No. I won’t kiss you! Boy — Then I warn you — I’ll play my ukulele! I question is, does he intend to warn the sensible young woman of the powerful romantic effects of the ukulele (from which she should flee for her own good), or does he warn of his particularly lousy musicianship (and she better kiss him to prevent the occasion)? 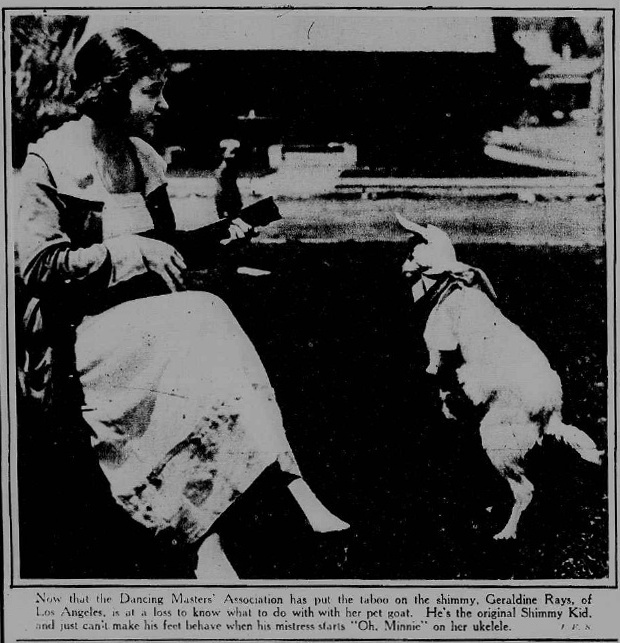 Here a great shot from 1919 — a goat doing the shimmy to ukulele music (from the New York Tribune, 14 September 1919). My attempts so far to identify the tune, “Oh, Minnie” have led me to “Minnie the Moocher” (too late), Minnie Bannister of Goon Show fame (too silly), and Minnie Mouse (too silly and too late) — my search continues.